Donald Trump has put the Consumer Financial Protection Bureau in play, with a review that could scale back the agency's oversight. Consumer-advocacy groups are up in arms, various banks and other lenders probably are breathing easier — and most Americans likely are still trying to figure it all out. The agency claims to have returned around $12 billion for 27 million harmed consumers, largely through canceled or reduced debts, while fielding around 1 million complaints and collecting millions of dollars in penalties. Yet it's safe to assume most Americans don't know all that much about the bureau. Here's a summary look at what the agency does. It's a federal agency that was formed under the Dodd-Frank Act, in the aftermath of the financial crisis. Its mission is to make consumer finance regulations more effective, to enforce the rules and educate people about mortgages, car loans, bank products and so on. "We protect consumers from unfair, deceptive or abusive practices and take action against companies that break the law," wrote its director, Richard Cordray, in a recent report. How big is the bureau? The agency operates on a budget of about half a billion dollars, having received $565 million in transfers from the Federal Reserve in fiscal 2016. It is headquartered in Washington, D.C., with offices in New York, Chicago and San Francisco. It employs around 1,650 people. Why was the bureau established? A lot of financial enforcement activities already had been overseen by other federal agencies, from the Federal Deposit Insurance Corp. to the Federal Trade Commission and the Department of Housing and Urban Development. Part of the rationale for the bureau was to centralize these rule-making, supervision and enforcement duties with a "single point of accountability" and to incorporate a centralized consumer-complaint process and database. What types of financial activities does the bureau oversee? The agency mostly focuses on problems tied to mortgages, student loans and other types of debt, along with banking or payment products such as prepaid cards. Oversight of debt collectors also has been a major theme, and it fields lots of complaints tied to credit reports. The bureau does much less with respect to investments such as mutual funds, bonds or stocks and little in other areas such as tax-return preparation, understanding retirement accounts, estate planning or wealth building. What's the complaint process all about? The bureau's website, consumerfinance.gov., provides a place to file a complaint, with the aim of receiving a response, and perhaps other help, from the financial company in question. The CFPB's database describes whether a complaint resulted in a response only or monetary relief or other actions. Complaints can be sorted by topic, state, zip code, company, date and in other ways, making it a helpful resource for spotting trends. Does the bureau penalize companies that bend the rules? Yes. The agency said it secured $254 million in compensation and other redresses in fiscal 2016, helping more than 1 million consumers and account holders. It collected just over $180 million in civil penalties in each of the past two fiscal years. That included a $100 million penalty against Wells Fargo Bank in September 2016 and a $21 million penalty against Wells Fargo in 2015. Other notable penalties include those from Citibank ($35 million), Chase Bank ($30 million) Green Tree Servicing ($15 million) plus Santander Bank, Flagstar Bank and PayPal/Bill Me Later Inc. ($10 million each). Phoenix-based DriveTime Automotive Group, a used-car dealer and financier, paid $8 million. What sort of feedback has the CFPB received? It has been all over the board. Critics hope the Trump Administration will scale back the bureau's powers, with the possibility that Cordray will be replaced by a more business-friendly director, possibly a panel of commissioners. Some also want the agency's funding determined by Congressional appropriations rather than Federal Reserve transfers. For example, Merrill Matthews, a scholar for the Institute for Policy Innovation, recently called the CFPB the "most unaccountable organization in Washington ... an agency that neither the people’s elected representatives nor the president can control." John Berlau of the Competitive Enterprise Institute accused Cordray of flooding financial companies, including community banks and credit unions, with "burdensome mandates" while imposing large fines. "His rules have made obtaining consumer financing more difficult — and likely impossible for the poorest in America." But the bureau also has supporters. Debbie Goldstein of the Center for Responsible Lending argued that the agency has provided valuable assistance to millions of people who have "suffered abuse at the hands of big banks like Wells Fargo, for-profit colleges like ITT Tech, car-title and payday lenders, credit card companies and other financial institutions." Michael Landis of the U.S. Public Interest Research Group argued that the nation needs a "strong and independent agency that looks out for consumers." The debate has been split between pro-business, anti-regulation groups against those who appreciate the need for a centralized federal regulator to oversee mortgages, credit reports, student loans and more — and who see value in a transparent complaint database. Until more consumers show an ability to handle the increasingly complex products and services being marketed to them, it seems to me that the bureau, or an agency like it, still has an important role to play. Hundreds of employees at the Consumer Financial Projection Bureau, a government agency first proposed by Sen. Elizabeth Warren (D., Mass. ), are paid higher salaries than members of Congress and Cabinet secretaries, according to a recent analysis by the Daily Caller News Foundation. 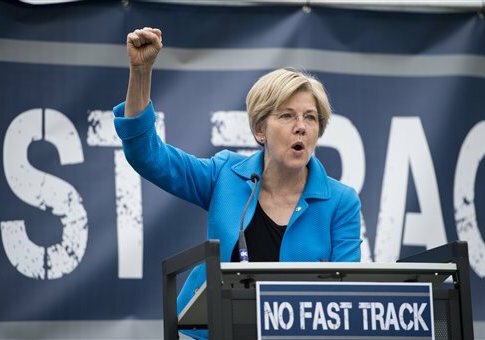 The CFPB was formed in 2011 after the passage of the Dodd–Frank Wall Street Reform and Consumer Protection Act the prior year and was originally conceived of by Warren when she was a law professor at Harvard. The agency, spearheaded by Warren, has been paying exorbitant salaries to many of its employees. Some of the larger salaries at the agency have eclipsed those paid to some of the country's most influential lawmakers, such as Senate Majority Leader Mitch McConnell (R., Ky.) and House Speaker Paul Ryan (R., Wis.), the Daily Caller News Foundation analysis found. Republicans have criticized the agency because of its structure, which has allowed it to operate without normal government oversight. Currently, the CFPB operates independently under the control of the Federal Reserve Board, as Warren intended. This prevents Congress from controlling costs or regulations put out by the agency. It also means agency salaries do not have to abide by the pay scale set for federal workers in other parts of the government. "This is just another reminder that the CFPB must be reined in and held accountable to the American people. The CFPB is one of the most unaccountable agencies in the federal government," Rep. Sean Duffy (R., Wis.) told the Daily Caller News Foundation. Duffy sits on the House Financial Services Committee, where he chairs the Subcommittee on Oversight and Investigations. The in-depth analysis uncovered that over 449 CFPB employees make over $100,000 and 228 employees make over $200,000. Nearly 200 of these employees make more than their most senior boss, Federal Reserve Chairwoman Janet Yellin, who earns $201,700 a year. Op-Ed: To fight Trump, journalists have dispensed with objectivity » « James T Harris: The Grammy's got Trumped!